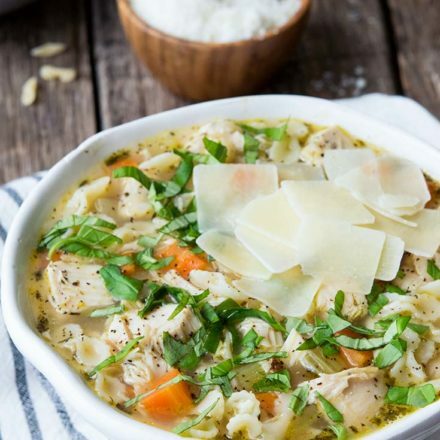 Let’s take chicken soup to the next level with Italian Chicken Soup. Loaded with chicken, pasta & flavor – this hearty soup is the real deal! How about a little comfort food Italian style? Italian Chicken Soup is like amped up chicken noodle soup. It’s packed with shredded chicken, veggies, and pasta swimming in a chicken broth base, flavored with wonder Italian seasonings. Not unlike many regions similar soups can fall under the same Italian Chicken Soup name. Carrabba’s Italian Chicken Soup recipe includes potatoes and pasta, and some recipes make Italian Chicken Soup with meatballs. Like most soups, this recipe is super easy to change up based on what you have on hand. 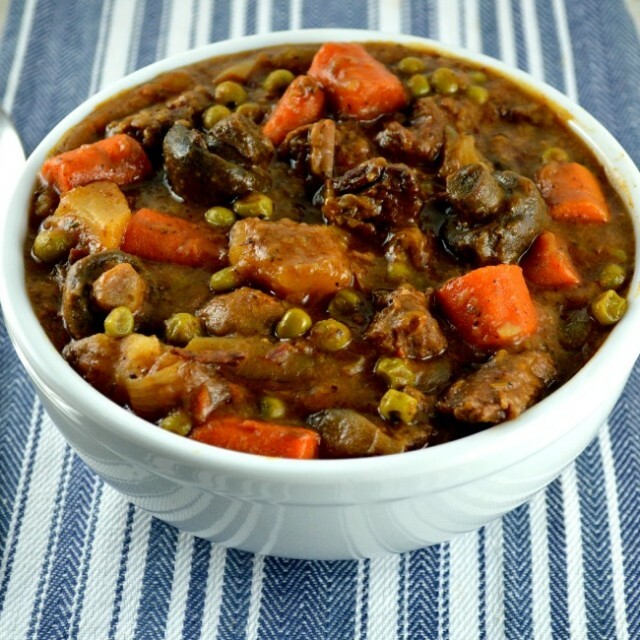 Add some extra veggies or a bit of leftover sausage- it all works and tastes delicious! I love soup’s flexibility. 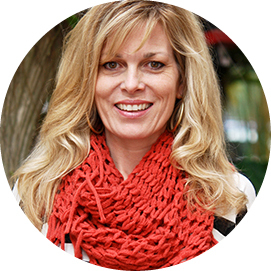 You can’t make it wrong, and it’s so simple to throw together! Call the family to dinner- Soup’s on the stove! 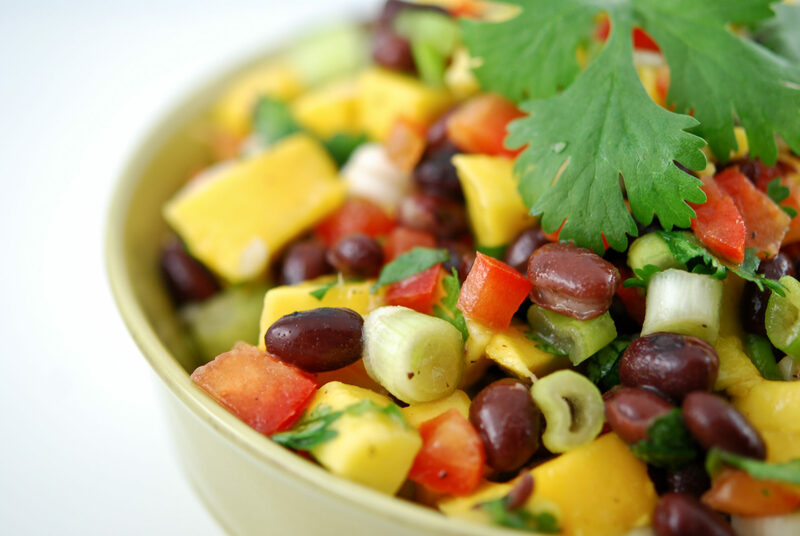 Begin by sautéing the aromatics and spices in olive oil before adding in the veggies to soften them up. Then, you’ll add chicken stock, bouillon, chicken, pasta, and Italian parsley to the pot and let everything simmer until the pasta is cooked through. 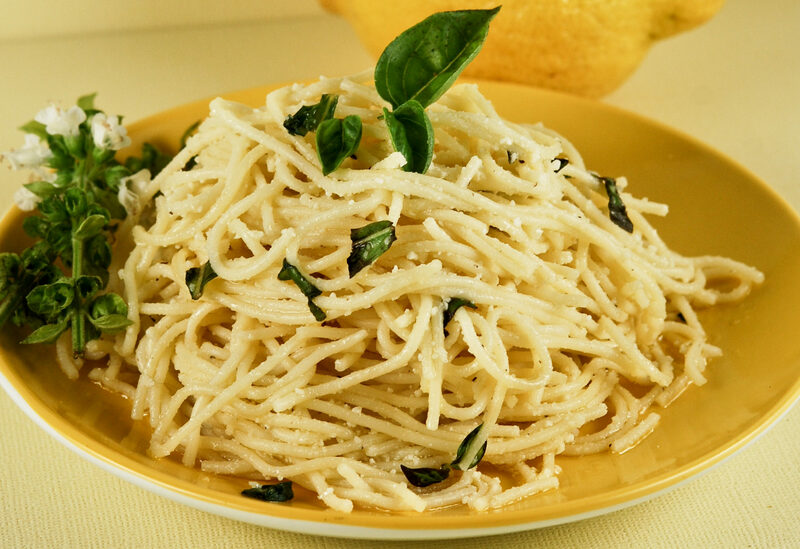 Ladle into bowls and top with fresh basil and parmesan cheese. Give southern Italian chicken soup a try by adding black eyed peas and okra to the mix! The okra thickens the soup slightly, and the peas bring additional body and flavor. Simple and scrumptious, Baked Italian Chicken is moist, flavorful, and goes great with pasta and salad! It’s a perfect midweek meal! Talk about a quick and easy meal! Italian Dressing Chicken takes a handful of simple, convenient ingredients and makes a main dish that’s sure to become a family favorite! I know it sounds fancy, but it’s actually a rustic Italian dish that’s been around for centuries. Italian Chicken Cacciatore is another one of my favorite Italian chicken dishes! Simple and tasty, it pulls together quickly and is a terrific Italian comfort food! Full of fantastic Italian flavor, Italian Chicken is a quick and easy way to change up your approach to cooking chicken. This from scratch Italian Chicken Marinade is a powerhouse of flavor. It’s incredibly easy to make and makes your chicken taste amazing! 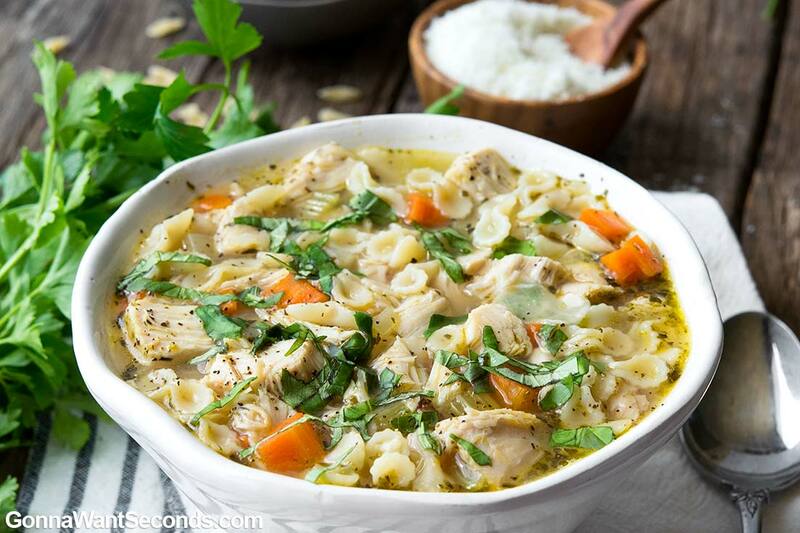 Italian Chicken Soup is a great make ahead meal! You might consider waiting until the day you plan to serve it to add the pasta so it doesn’t get too mushy. The rest of the soup will keep beautifully in the fridge for a couple of days. In the rare event that you have leftovers, you can add a bit of chicken stock or water if it’s too thick when you reheat it. How Do You Freeze Italian Chicken Soup? 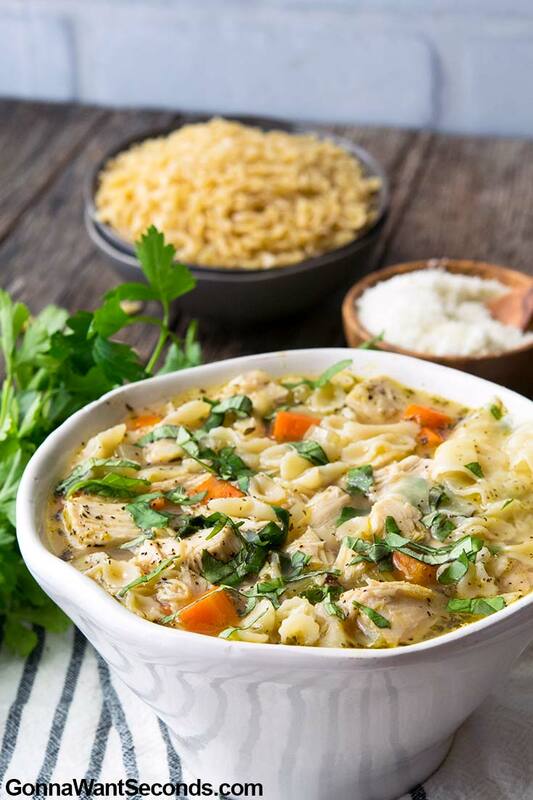 Whether you’re making Italian Chicken Soup with orzo or Italian Chicken Soup with ditalini pasta in it, if you’re plan is to freeze it you’ve got to think ahead. There are two schools of thought when it comes to freezing soup that contains pasta. I personally prefer the uncooked pasta added when you’re reheating it. I think the resulting texture is nicer. However, you can freeze it in its entirety. The pasta might look a bit overdone when reheating, but it will still be delicious! It’s really all up to your pasta texture preference. Regardless of pasta in or out, be mindful of your freezing technique, check out general freezing guidelines. Make sure the soup is completely cooled before sticking in the freezer, and leave a little space in the container since it will expand a bit when it freezes. This soup will hold for about 3 months in the freezer. Pasta Selection: You don’t have to worry about picking the perfect pasta for this soup. 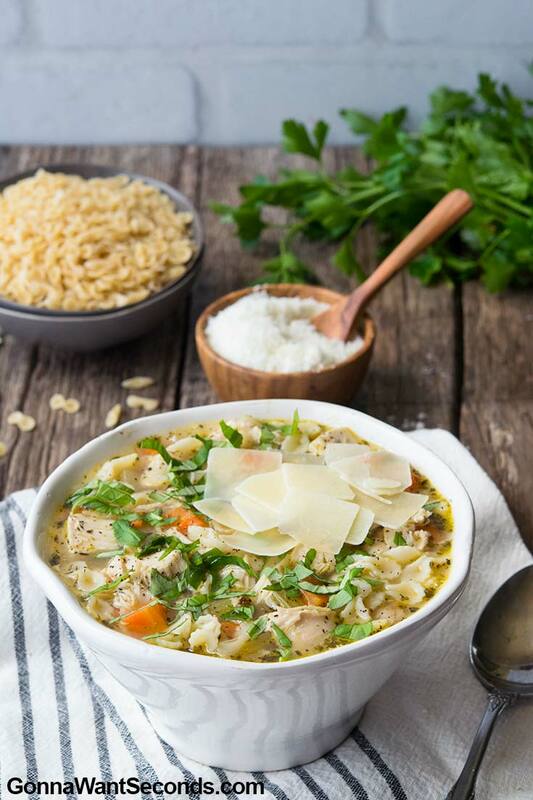 Italian Chicken Soup with pastina simply means that it is traditionally made with small pasta, but it sounds a lot fancier when you say pastina than tiny noodles! Some options to try include ditalini, or small shells. The Italian Chicken Soup Giada De Laurentiis style on the other uses stelline pasta (pasta stars). You can even use the letter noodles and make alphabet soup for the kiddos! However, any pasta noodles will work! 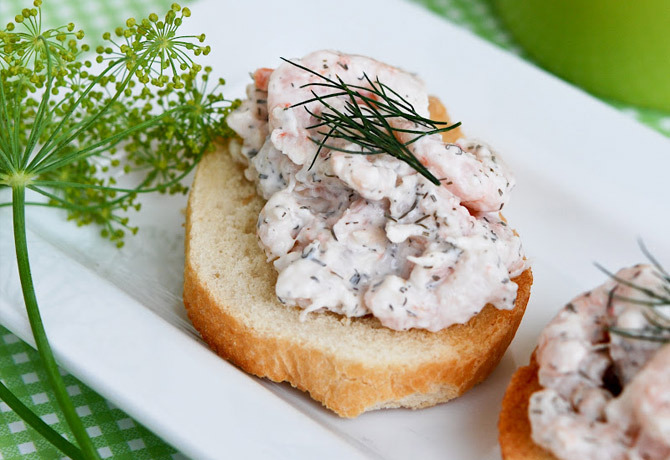 Chicken: You’ll need cooked chicken for this recipe. If you’re cooking it specifically for the soup, I suggest baking with just a little salt and pepper. White and dark meat both work, but dark meat can be a bit greasy, so I’d suggest using it sparingly. Don’t forget- cook chicken to a minimum of 165°. Rotisserie chicken is a great shortcut. Try the lemon pepper seasoned chicken to add a slight twist to the flavor of the soup! Shredding chicken: This can be a bit tedious, but I think shredded chicken in soup is so much nicer than cut up cubes. The shreds mingle with the pasta and veggies better than cut chicken. To shred chicken, you can use the two fork method. Debone the chicken and pull the forks in opposite directions across the meat. You can also use a hand mixer on low speed. Pull the cooked chicken apart into large chunks with no bones and using both beaters, mix until the chicken is shredded. I promise it’s worth the effort in the end! Well, friends, there you have my Italian Chicken Soup recipe. I hope you love the Italian twist on chicken soup as much as I do! I can’t wait to hear from you in the comments below! 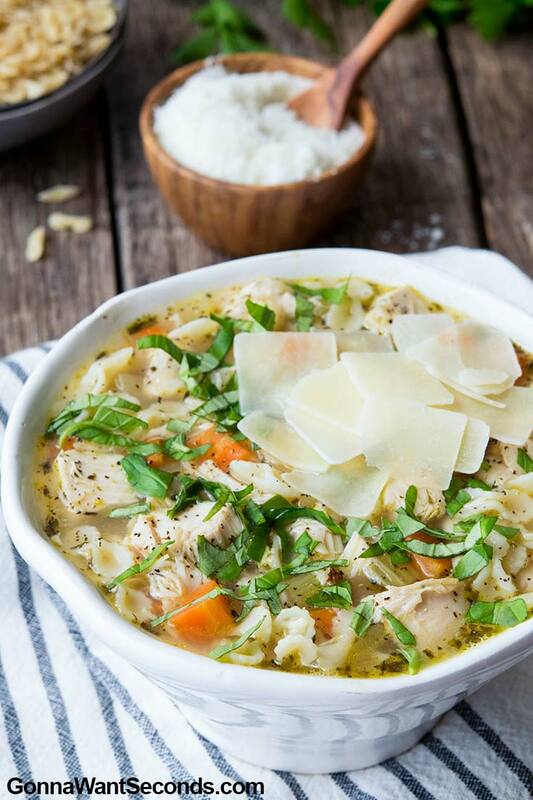 Let’s take chicken soup to the next level with Italian Chicken Soup. 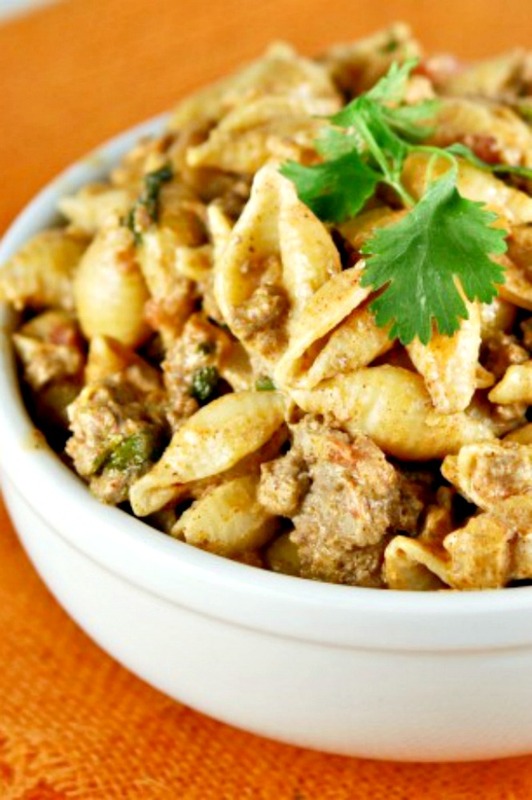 Loaded with chicken, pasta & flavor - this hearty soup is the real deal! Heat olive oil to a large pot over medium heat. Add the onion, garlic, carrots, celery, Italian seasoning, and bay leaf. Cook, stirring often until vegetables are tender, about 7-8 minutes. Add 8 cups of chicken stock, Better Than Bouillon, rosemary sprig, salt, and pepper then bring to a boil. Reduce heat and simmer, uncovered, until the veggies are tender (about 10-12 minutes). Add the pasta and chicken simmering until the pasta is just al dente. Stir in the Italian parsley and basil. Adjust seasoning if needed. To serve, ladle soup into each bowl, then top with a generous pinch of shaved Parm. Try our Italian Sausage Soup , Chicken Tortellini Soup and or our Italian Stuffed Peppers – Prego! 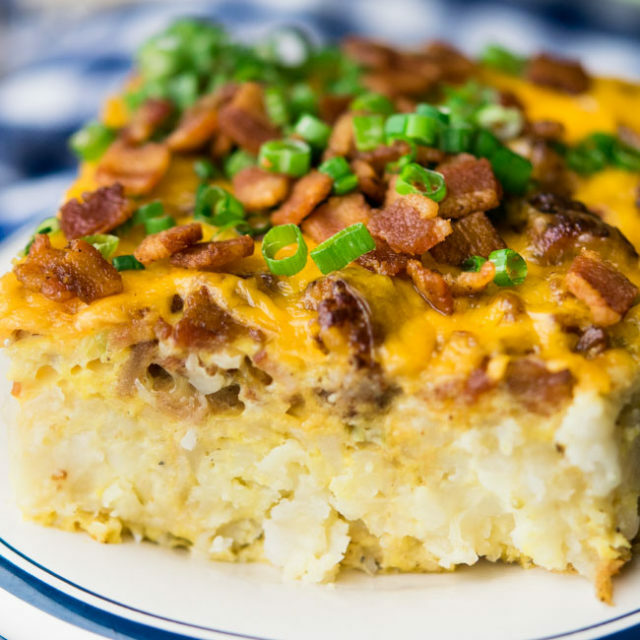 Can’t WAIT to make this, yum yum yum!